Over a month ago, we hosted my son Rocky’s first birthday party. It was a super fun celebration for friends and family that deserves its own post. I was tearing up the baby dance floor with my Boo in my arms to some Yo Gabba Gabba tunes, “There’s a party in my tummy! So yummy, so yummy…” when my friend’s little girl asked me a question. “Lacie, so Rocky is your baby, right?” This child knew nothing of the adoption, she was just ripping up the dance floor, trying to put everyone together. I replied, “Yes, you are right. Rocky is my baby, the cutest baby in the WORLD!” We laughed and kept on boogeying. Then, my seven-year-old cousin chimed in, “Well, he’s not her REAL baby. He wasn’t in her tummy. His REAL mommy is over there!” [insert the startling sound of a record scratching and my heart beating out of my chest] Maya, Rocky’s birth mom was standing right there snapping pictures of all of us. Luckily, we have an awesome relationship with her and she didn’t seem to be phased. I explained, “I am Rocky’s real mommy. You are right, Maya is his birth mommy. He was in her tummy.” Then I swiftly steered the conversation in another direction. Some things are just too heady for the dance floor. I kept beating myself up. I was rattled in the moment. But the more I thought about it, the clearer the real issue became. The children in my family love Rocky as much (or more because he’s a super cute baby) as they do any other member of our family. My little cousin just didn’t have the vocabulary to express what she was thinking. Why hadn’t I had this discussion with the kids earlier? As we all know, hindsight is twenty-twenty. I contacted my cousins (the mothers of the girls with whom I needed to talk) and we set up a lunch date. 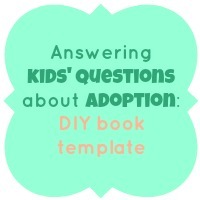 Then, I went on a mission to create a tool to help me talk to the kids in my family, and eventually our son, about adoption. Good teachers know that kids learn better when they are actively engaged, therefore I needed to create an interactive tool. I also wanted to start with what they already know, another teacher tidbit. Plenty of pictures were also a must. Here are the results (click on the images to make them larger). I uploaded the booklet and had a copy for each girl and for me printed at our local UPS store. I put the girls’ booklets in the mail so that they can go through them with their parents before our lunch date. They each got their own special package, all decked out with stickers. Kids of all ages love stickers, it’s a known fact. I wanted to keep it as a Word document so I can change it and update the pictures depending upon my audience. It will be nice for each child on our family to have a customized book where they see themselves as an important part of our adoption. I also included a final page where they can write any questions they still have and a place to write a special message to Rocky. It will also be good for Rocky to be in on these talks. He’ll be able to answer questions as he gets older and his adoption story will always be an important part of who he is. The more we practice this, the more comfortable we will all be when spontaneous situations arise. We are having our lunch date on Saturday. The girls will bring their booklets and we will read and talk about each page. They will be able to ask questions and enjoy our time together. It was important for me to set apart this special time for them and not pull them aside at a family event. I didn’t want them to feel like they were in trouble for something. I am looking forward to our date. I am really excited to see the pictures that they’ve drawn. We strive to have an open and respectful adoption. If I want all the members of our family to be as comfortable talking about our adoption as I am, then it’s my job to give them the tools that they need and to open up the lines of communication. Lacie was on a long, winding, and detoured-filled road to motherhood for over a decade. In February of 2012, her little miracle was born and she became a mother to the most precious little boy through open adoption. She strives to approach adoption with a spirit of openness, gratitude and respect for all who are involved. When she’s not chasing a toddler, she loves to write, teach, travel, spend time with her best friend/husband, read, and post pictures on Instagram. Find her at Funnylittlepollywogs.com and @lacie_b on Instagram. You know I love this, Lacie! Bravo, dear friend!! Thanks Amber! You continue to be an inspiration to me as I navigate this world of open adoption! This is so fantastic! Just wondering – there is a picture up there that says “DIY Book Template” – is it supposed to go to a downloadable file? Cause I’m really hoping something like that is available – this is just awesome! I don’t think that there is a downloadable file (at least I didn’t submit one as a guest blogger). If you click on each image, they will become become bigger. I think the idea is that you can then just set your book up like I did in a word document and use my book for ideas and then customize your own. Good luck! If you go to my blog and comment, I’ll have your e-mail address. If you’d like to bounce some ideas off of me, let me know as I’d be happy to help!